There is an Arabian proverb: A novel is a garden carried in the pocket. If this is so, an increasing number of book club readers in Western Australia enjoy literary gardens. The non-profit Kalamunda Community Learning Centre, based in the hills east of Perth, hires out books, mainly fiction, to 35 clubs. Eleven of these book clubs meet at the Centre, while others gather in various suburbs and their secretaries come to the Centre to choose, take away or return their selections. The remainders of the clubs are in rural districts and the Centre mails parcels of books to them. Books that are purchased retail at the most advantageous price that can be found. Twelve copies of each title are bought, as the clubs have a maximum of 12 members each. Towards the end of each year a list of about 160 titles is issued and country clubs send in about 20 possible choices. The Centre tries to send one of each club’s choices each month. Some of the rural clubs are composed of people from farming families with no close access to a public library or bookshop. A charge of $3 per copy is made to all clubs. Photocopied notes, from reasonably authoritative sources, are available for each title. Club-members take a book home to read and perhaps make notes, before taking it to the following month’s meeting to discuss. While some of the latest books are listed every year, favorites dating back over many decades are there too. Kalamunda Community Learning Centre began in 1977, primarily for women, with the philosophy of learning through sharing. Co-ordinators, tutors and work-group leaders all are volunteers. The only paid staff are those who run the crèche. At present there are 600 enrolments for 80 classes a week. There has always been a strong interest in the book clubs. Weipa Waders is a group of eight, and we live in a remote mining town of 3,500 people on the West Coast of Queensland, near the tip of Cape York. Our nearest city is Cairns, which is 800 km away on a dirt road that is closed for four months of the year and takes 10 hours to drive, or an hour and a half flight if we need to get out in a hurry. Most of our supplies come by barge from Cairns. We do have a newsagent with a limited range of books for sale, and a small library where we can order in books, but being members of CAE, Victoria, is an ideal way for us to access sets of books on regular basis. The best part about book club is reading books you may never have considered reading previously. At year’s end, we all submit our ideas for the following year’s selection so with choices coming from the whole group, the list covers a wide range of interests. Sometimes the books just don’t work out – Box 817 Emperor’s China, People’s China was a little like a text book and some didn’t even attempt it, yet it was very interesting to others. The opposite extreme was our experience of reading Box 105 The Adventures of Huckleberry Finn, which had a lot of members enthusiastically reliving their childhood reading experiences. We normally meet in Alexis and Geoff’s home, and drink copious amounts of tea – green, black, or black with milk – but on the occasion in the photo, we were sadly farewelling our GP Donna who has been promoted to Charleville Hospital. For the meeting of the hand-out of The Guernsey Literary and Potato Peel Pie Society, we actually had a potato peel pie for supper! The taste of the potato peel crust quite surprised us all and really put us in the mood for reading the book. To honour the 200th birthday of Charles Dickens, this month we read A Christmas Carol as well as our book club selection, Nineteen Eighty Four. The conversation on A Christmas Carol certainly lightened the mood following the discussion of George Orwell’s depressing yet amazing predictions. 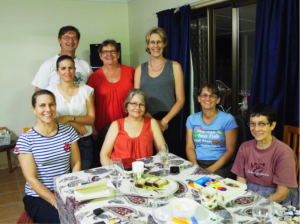 May marks Weipa Waders’ tenth anniversary with the first meeting taking place on May 20th, 2002, and we still have two very active inaugural members, Karen Pritchard and Kath Newman. The group dynamics have changed over the years, but it has always been a pleasure to attend meetings and share our love of reading. At the moment, our group is quite diverse and includes a GP, a minister of religion, an IT expert, and an accountant, amongst other specialties, which means we have some very interesting discussions. Our only male member Geoff has been the lone ranger for some years, but enjoys putting the male point of view across and has a thick skin on some occasions! Most of us only meet at book club yet we know our friendship allows us to be frank and honest with our interpretations and understandings, as well as have our numerous questions answered. For more information about CAE Book Groups, click here.